Feature: Property on a manor (2 units in total). country cottage. Furnishing: holiday standard, rustic, tiled floor, cotto floor. Please note: Non-smoking house. The owner does not accept any youth groups. part of terraced house, 6 people, 4 room/s, 3 bedroom/s, 3 bathroom/s, approx. 130 m², 3 floor/s, panoramic view. Bedroom 2: (floor 1): double bed, seating accommodation, exit to the veranda. Bedroom 3: (attic, limited height): 2 x single bed. Additional information: direct access to sanitary no 3. Little kitchen: Kitchen/ cooking equipment: 4 gas rings, oven, microwave oven, dish-washer, combination fridge-freezer, toaster. separate (ground floor). Sanitary 3: (attic, limited height, access from one bedroom only): bath tub, WC. Estate: (shared use with holiday guests): approx. 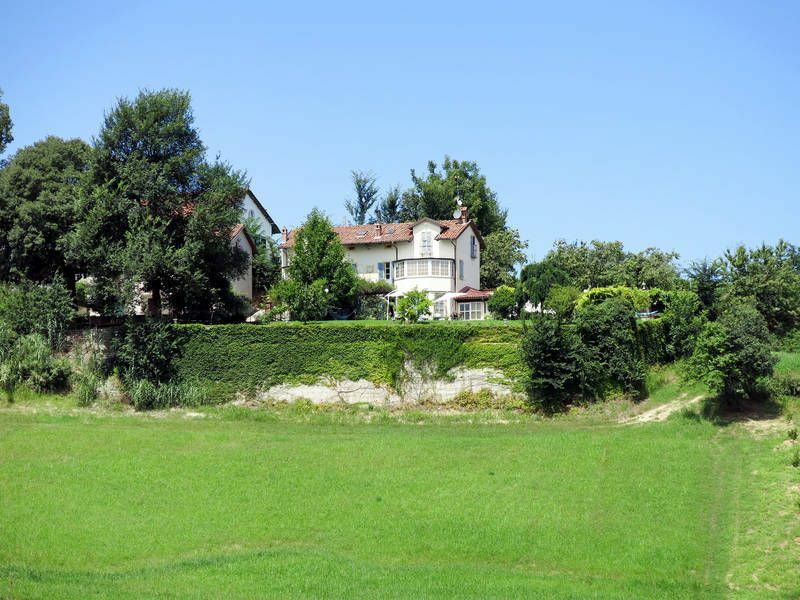 3000 m² (whole estate 1.5 ha) , with plants, garden, meadow. On the neighbouring estate dogs, cats, horses. Pool: (shared use): 10.0 x 5.0 m, 1.30 m deep, 25.05.19-28.09.19, frame swimming pool, pool maintenance by the caretaker 1 time(s) per week. Pool area: deck chairs, sun loungers, external shower, WC. Please note: obligation to wear bathing caps. distance to the pool approx. 100 m.
Situation: in the district Torrazzo, rural, panoramic view. Plot description: parking on the estate. private part of the estate, partially self-contained (fence), garden, meadow. terrace, reserved open space, furnishing provided, brick barbecue. Arrival: Airport Turin in approx. 50 km. Train station Asti in approx. 15 km. Next village/town: Alba in approx. 25 km. Asti in approx. 15 km. Center San Damiano d'Asti in approx. 2 km. Shopping: Next supermarket (San Damiano d'Asti) in approx. 2 km. Das Haus liegt ruhig und hat eine schöne Aussicht auf die Hügelzüge. Einkaufsmöglichkeiten sind im Städtchen San Damiano d´Asti reichlich vorhanden. Die schönen mittelalterlichen Städtchen, Burgen und Schlösser und die bekannten Weingüter sind leicht zu erreichen mit Auto(! )fahrten durch die Weinberge. Das Haus und die Terasse sind gemütlich und zweckmässig eingerichtet. Ebenso ist die kleine Küche durchaus geeignet, um für 5 Leute zu kochen (wer mehr als das Nötigste dazu braucht, kann einiges von zuhause mitnehmen, wie wir dies taten.) Die Besitzerin ist uns sehr freundlich und herzlich begegnet.